With acoustic guitars more popular than ever (thanks, Ed Sheeran), it's never been more important to get a good electro-acoustic tone, and Xvive is on hand to make that as simple as possible with Mike. Mike uses Spectral Reassignment Technology to reproduce the room sound of classic electro-acoustic guitar tones, enhancing your electro's plugged-in sound and "making it sound more like the guitar itself". 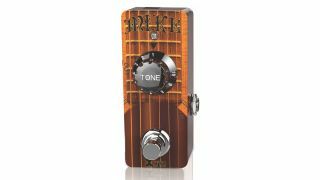 Nine presets are on hand to sculpt the Mike's sound via a big ol' tone knob, and Xvive reckons it'll be handy in the studio and on the stage. Sounds promising, and we're intrigued to see how it stacks up to TC Electronic's BodyRez. Mike is available now for £99.99.